If your rabbit is not posed correctly, you cannot accurately evaluate its body type. These are step-by-step instructions for how to pose a rabbit for judging, evaluating, or 4-H showmanship. These instructions apply to most commercial and compact-type breeds such as Mini Rex, Polish, Dutch, Californian, Satin, New Zealand, and other meat pen breeds. 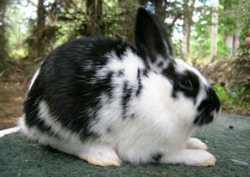 These instructions do not apply to the compact-type breeds: Holland Lops, Netherland Dwarfs, American Fuzzy Lops, and Jersey Woolies, which are posed more upright. These instructions also do not apply to Himalayans, Semi-arch breeds such as Flemish Giants, and Full-Arch breeds such as tans. * Click here for an article on how to pose Holland Lops. 1. 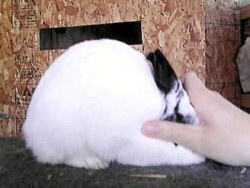 Turn the rabbit to face your right and place your right hand gently over the head. 2. With your left hand, position the front feet so they are directly below the eyes and flat on the ground. 3. Position the hind feet so they are directly below the hips. 4. Without distorting the feet placement, tuck the rabbit’s hindquarters up just enough that the body is compact and rounded. The rabbit should not be stretched out or too tucked up. 5. Place ears and tail in proper position for the breed. 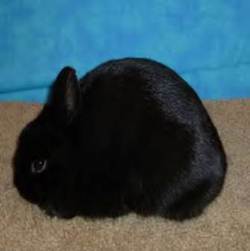 This rabbit is too “tucked up.” Its front feet are placed too far back and its hind feet are too far forward. This rabbit is not properly posed either. Its feet are incorrectly positioned and the pose is lacking finishing touches. Need we say, too stretched out? You should place your hand over the rabbit’s head to steady it while you pose. These instructions apply to compact type breeds English Angora, Standard Chinchilla, Dutch, Dwarf Hotot, Florida White, Havana, Lilac, Mini Lop, Mini Rex, Mini Satin, Polish, Thrianta; and commercial-type breeds French Angora, Giant Angora, Satin Angora, Champagne d’Argent, Californian, Cinnamon, American Chinchilla, Cream d’Argent, Harlequin, Blanc de Hotot, New Zealand, Palomino, Rex, American Sable, Satin, SIlver Fox, and Silver Marten. *We are interested in articles illustrated with photos on how to pose Netherland Dwarfs, Fuzzy Lops, Jersey Woolies, and Himalayans. Email us! Are you posing your rabbits or molding them?